Triamcinolone acetonide, USP, the active ingredient in Azmacort® Inhalation Aerosol, is a corticosteroid with a molecular weight of 434.5 and with the chemical designation 9-Fluoro-11(beta),16(alpha),17,21-tetrahydroxypregna-1,4-diene-3,20-dione cyclic 16,17-acetal with acetone. (C 24 H 31 FO 6 ). Azmacort Inhalation Aerosol is a metered-dose aerosol unit containing a microcrystalline suspension of triamcinolone acetonide in the propellant dichlorodifluoromethane and dehydrated alcohol USP 1% w/w. Each canister contains 60 mg triamcinolone acetonide. The canister must be primed prior to the first use. After an initial priming of 2 actuations, each actuation delivers 200 mcg triamcinolone acetonide from the valve and 100 mcg from the spacer-mouthpiece under defined in vitro test conditions. The canister will remain primed for 3 days. If the canister is not used for more than 3 days, then it should be reprimed with 2 actuations. There are at least 240 actuations in one Azmacort Inhalation Aerosol canister. After 240 actuations, the amount delivered per actuation may not be consistent and the unit should be discarded. Triamcinolone acetonide is a more potent derivative of triamcinolone. Although triamcinolone itself is approximately one to two times as potent as prednisone in animal models of inflammation, triamcinolone acetonide is approximately 8 times more potent than prednisone. The precise mechanism of the action of glucocorticoids in asthma is unknown. However, the inhaled route makes it possible to provide effective local anti-inflammatory activity with reduced systemic corticosteroid effects. Though highly effective for asthma, glucocorticoids do not affect asthma symptoms immediately. While improvement in asthma may occur as soon as one week after initiation of Azmacort Inhalation Aerosol therapy, maximum improvement may not be achieved for 2 weeks or longer. Based upon intravenous dosing of triamcinolone acetonide phosphate ester, the half-life of triamcinolone acetonide was reported to be 88 minutes. The volume of distribution (Vd) reported was 99.5 L (SD ± 27.5) and clearance was 45.2 L/hour (SD ± 9.1) for triamcinolone acetonide. The plasma half-life of glucocorticoids does not correlate well with the biologic half-life. The pharmacokinetics of radiolabeled triamcinolone acetonide [ 14 C] were evaluated following a single oral dose of 800 mcg to healthy male volunteers. Radiolabeled triamcinolone acetonide was found to undergo relatively rapid absorption following oral administration with maximum plasma triamcinolone acetonide and [ 14 C]-derived radioactivity occurring between 1.5 and 2 hours. Plasma protein binding of triamcinolone acetonide appears to be relatively low and consistent over a wide plasma triamcinolone acetonide concentration range as a function of time. The overall mean percent fraction bound was approximately 68%. The metabolism and excretion of triamcinolone acetonide were both rapid and extensive with no parent compound being detected in the plasma after 24 hours post-dose and a low ratio (10.6%) of parent compound AUC 0-(infinity) to total [ 14 C] radioactivity AUC 0-(infinity) . Greater than 90% of the oral [ 14 C]-radioactive dose was recovered within 5 days after administration in 5 out of the 6 subjects in the study. Of the recovered [ 14 C]-radioactivity, approximately 40% and 60% were found in the urine and feces, respectively. Three metabolites of triamcinolone acetonide have been identified. 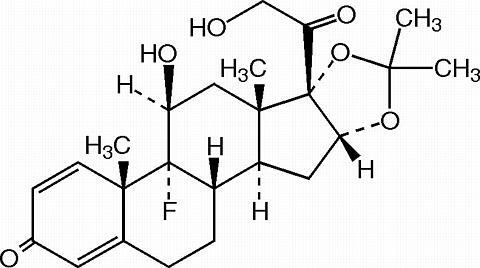 They are 6(beta)-hydroxytriamcinolone acetonide, 21-carboxytriamcinolone acetonide and 21-carboxy-6(beta)-hydroxytriamcinolone acetonide. All three metabolites are expected to be substantially less active than the parent compound due to (a) the dependence of anti-inflammatory activity on the presence of a 21-hydroxyl group, (b) the decreased activity observed upon 6-hydroxylation, and (c) the markedly increased water solubility favoring rapid elimination. There appeared to be some quantitative differences in the metabolites among species. No differences were detected in metabolic pattern as a function of route of administration. Double-blind, placebo controlled efficacy and safety studies have been conducted in asthma patients with a range of asthma severities, from those patients with mild disease to those with severe disease requiring oral steroid therapy. The efficacy and safety of Azmacort Inhalation Aerosol given twice daily was demonstrated in two placebo-controlled clinical trials. In two separate studies, 222 asthmatic patients were randomized to receive either Azmacort Inhalation Aerosol 400 mcg twice daily or matching placebo for a treatment period of 6 weeks. Patients were adult asthmatics who were using inhaled beta 2 -agonists on more than an occasional basis (at least three times weekly), either without or with inhaled corticosteroids, for control of their asthma symptoms. For the combined studies, 48% (52/109) patients randomized to placebo and 41% (46/113) patients randomized to Azmacort Inhalation Aerosol treatment were previously treated with inhaled corticosteroids. Results of weekly lung function tests (FEV 1 ) from one of these trials is presented graphically below. Results of the second study are presented in tabular form as the changes in asthma measures from baseline to the end of the treatment period. a Endpoint results are obtained from the last evaluable data, regardless of whether the patient completed 6 weeks of treatment. 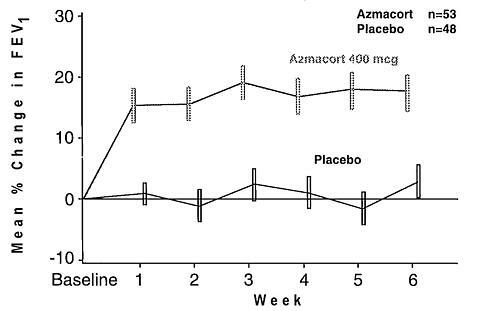 In both studies, treatment with Azmacort Inhalation Aerosol (400 mcg twice daily) resulted in significant improvements in all clinical asthma measures (lung functions, asthma symptoms, use of as-needed beta 2 -agonist medications) when compared to placebo. Azmacort Inhalation Aerosol is indicated in the maintenance treatment of asthma as prophylactic therapy. Azmacort Inhalation Aerosol is also indicated for asthma patients who require systemic corticosteroid administration, where adding Azmacort may reduce or eliminate the need for the systemic corticosteroids. Azmacort Inhalation Aerosol is NOT indicated for the relief of acute bronchospasm. Azmacort Inhalation Aerosol is contraindicated in the primary treatment of status asthmaticus or other acute episodes of asthma where intensive measures are required. Hypersensitivity to triamcinolone acetonide or any of the other ingredients in this preparation contraindicates its use. Particular care is needed in patients who are transferred from systemically active corticosteroids to Azmacort Inhalation Aerosol because deaths due to adrenal insufficiency have occurred in asthmatic patients during and after transfer from systemic corticosteroids to aerosolized steroids in recommended doses. After withdrawal from systemic corticosteroids, a number of months is usually required for recovery of hypothalamic-pituitary-adrenal (HPA) function. For some patients who have received large doses of oral steroids for long periods of time before therapy with Azmacort Inhalation Aerosol is initiated, recovery may be delayed for one year or longer. During this period of HPA suppression, patients may exhibit signs and symptoms of adrenal insufficiency when exposed to trauma, surgery, or infections, particularly gastroenteritis or other conditions with acute electrolyte loss. Although Azmacort Inhalation Aerosol may provide control of asthmatic symptoms during these episodes, in recommended doses it supplies only normal physiological amounts of corticosteroid systemically and does NOT provide the increased systemic steroid which is necessary for coping with these emergencies. During periods of stress or a severe asthmatic attack, patients who have been recently withdrawn from systemic corticosteroids should be instructed to resume systemic steroids (in large doses) immediately and to contact their physician for further instruction. These patients should also be instructed to carry a warning card indicating that they may need supplementary systemic steroids during periods of stress or a severe asthma attack. Localized infections with Candida albicans have occurred infrequently in the mouth and pharynx. These areas should be examined by the treating physician at each patient visit. The percentage of positive mouth and throat cultures for Candida albicans did not change during a year of continuous therapy. The incidence of clinically apparent infection is low (2.5%). These infections may disappear spontaneously or may require treatment with appropriate antifungal therapy or discontinuance of treatment with Azmacort Inhalation Aerosol. Children who are on immunosuppressant drugs are more susceptible to infections than healthy children. Chickenpox and measles, for example, can have a more serious or even fatal course in children on immunosuppressant doses of corticosteroids. In such children, or in adults who have not had these diseases, particular care should be taken to avoid exposure. If exposed, therapy with varicella zoster immune globulin (VZIG) or pooled intravenous immunoglobulin (IVIG), as appropriate, may be indicated. If chickenpox develops, treatment with antiviral agents may be considered. Azmacort Inhalation Aerosol is not to be regarded as a bronchodilator and is not indicated for rapid relief of bronchospasm. As with other inhaled asthma medications, bronchospasm may occur with an immediate increase in wheezing following dosing. If bronchospasm occurs following use of Azmacort Inhalation Aerosol, it should be treated immediately with a fast-acting inhaled bronchodilator. Treatment with Azmacort Inhalation Aerosol should be discontinued and alternative treatment should be instituted. Patients should be instructed to contact their physician immediately when episodes of asthma which are not responsive to bronchodilators occur during the course of treatment with Azmacort Inhalation Aerosol. During such episodes, patients may require therapy with systemic corticosteroids. The use of Azmacort Inhalation Aerosol with systemic prednisone, dosed either daily or on alternate days, could increase the likelihood of HPA suppression compared to a therapeutic dose of either one alone. Therefore, Azmacort Inhalation Aerosol should be used with caution in patients already receiving prednisone treatment for any disease. Transfer of patients from systemic steroid therapy to Azmacort Inhalation Aerosol may unmask allergic conditions previously suppressed by the systemic steroid therapy, e.g., rhinitis, conjunctivitis, and eczema. During withdrawal from oral steroids, some patients may experience symptoms of systemically active steroid withdrawal, e.g., joint and/or muscular pain, lassitude, and depression, despite maintenance or even improvement of respiratory function. (See DOSAGE AND ADMINISTRATION .) Although steroid withdrawal effects are usually transient and not severe, severe and even fatal exacerbation of asthma can occur if the previous daily oral corticosteroid requirement had significantly exceeded 10 mg/day of prednisone or equivalent. In responsive patients, inhaled corticosteroids will often permit control of asthmatic symptoms with less suppression of HPA function than therapeutically equivalent oral doses of prednisone. Since triamcinolone acetonide is absorbed into the circulation and can be systemically active, the beneficial effects of Azmacort Inhalation Aerosol in minimizing or preventing HPA dysfunction may be expected only when recommended dosages are not exceeded. Suppression of HPA function has been reported in volunteers who received 4000 mcg daily of triamcinolone acetonide by oral inhalation. In addition, suppression of HPA function has been reported in some patients who have received recommended doses for as little as 6 to 12 weeks. Since the response of HPA function to inhaled corticosteroids is highly individualized, the physician should consider this information when treating patients. When used at excessive doses or at recommended doses in a small number of susceptible individuals, systemic corticosteroid effects such as hypercorticoidism and adrenal suppression may appear. If such changes occur, Azmacort Inhalation Aerosol should be discontinued slowly, consistent with accepted procedures for reducing systemic steroid therapy and for management of asthma symptoms. Azmacort Inhalation Aerosol should be used with caution, if at all, in patients with active or quiescent tuberculosis infection of the respiratory tract; untreated systemic fungal, bacterial, parasitic, or viral infections; or ocular herpes simplex. The long-term local and systemic effects of Azmacort Inhalation Aerosol in human subjects are still not fully known. While there has been no clinical evidence of adverse experiences, the effects resulting from chronic use of Azmacort Inhalation Aerosol on developmental or immunologic processes in the mouth, pharynx, trachea, and lung are unknown. Because of the possibility of systemic absorption of inhaled corticosteroids, patients treated with these drugs should be observed carefully for any evidence of systemic corticosteroid effects including suppression of growth in children. Particular care should be taken in observing patients postoperatively or during periods of stress for evidence of a decrease in adrenal function. Information for Patients: Patients being treated with Azmacort Inhalation Aerosol should receive the following information and instructions. This information is intended to aid them in the safe and effective use of this medication. It is not a complete disclosure of all possible adverse or intended effects. In clinical studies and post-marketing experience with Azmacort Inhalation Aerosol, local infections of the oropharynx with Candida albicans have occurred. When such an infection develops, it should be treated with appropriate local or systemic ( i.e., oral antifungal) therapy while remaining on treatment with Azmacort Inhalation Aerosol. However, at times therapy with Azmacort Inhalation Aerosol may need to be interrupted. Carcinogenesis, Mutagenesis, Impairment of Fertility: No evidence of treatment-related carcinogenicity was demonstrated after two years of once daily gavage of triamcinolone acetonide at doses of 0.05, 0.2, and 1.0 mcg/kg (approximately 0.02, 0.07, and 0.4% of the maximum recommended human daily inhalation dose on a mcg/m 2 basis) in the rat and 0.1, 0.6, and 3.0 mcg/kg (approximately 0.02, 0.1, and 0.6% of the maximum recommended human daily inhalation dose on a mcg/m 2 basis) in a mouse. Mutagenesis studies with triamcinolone acetonide have not been carried out. No evidence of impaired fertility was manifested when oral doses of up to 15.0 mcg/kg (8% of the maximum recommended human daily inhalation dose on a mcg/m 2 basis) were administered to female and male rats. However, triamcinolone acetonide at oral doses of 8 mcg/kg (approximately 4% of the maximum recommended human daily inhalation dose on a mcg/m 2 basis) caused dystocia and prolonged delivery and at oral doses of 5.0 mcg/kg (approximately 2.5% of the maximum recommended human daily inhalation dose on a mcg/m 2 basis) and above caused increases in fetal resorptions and stillbirths and decreases in pup body weight and survival. At a lower dose of 1.0 mcg/kg (approximately 0.5% of the maximum recommended human daily inhalation dose on a mcg/m 2 basis) it did not induce the above mentioned effects. Pregnancy: Pregnancy Category C. Triamcinolone acetonide has been shown to be teratogenic at inhalational doses of 20, 40, and 80 mcg/kg in rats (approximately 0.1, 0.2, and 0.4 times the maximum recommended human daily inhalation dose on a mcg/m 2 basis, respectively), in rabbits at the same doses (approximately 0.2, 0.4, and 0.8 times the maximum recommended human daily inhalation dose on a mcg/m 2 basis, respectively) and in monkeys, at an inhalational dose of 500 mcg/kg (approximately 5 times the maximum recommended human daily inhalation dose on a mcg/m 2 basis). Dose related teratogenic effects in rats and rabbits included cleft palate and/or internal hydrocephaly and axial skeletal defects whereas the teratogenic effects observed in the monkey were CNS and/or cranial malformations. There are no adequate and well controlled studies in pregnant women. Triamcinolone acetonide should be used during pregnancy only if the potential benefit justifies the potential risk to the fetus. Experience with oral glucocorticoids since their introduction in pharmacologic as opposed to physiologic doses suggests that rodents are more prone to teratogenic effects from glucocorticoids than humans. In addition, because there is a natural increase in glucocorticoid production during pregnancy, most women will require a lower exogenous steroid dose and many will not need glucocorticoid treatment during pregnancy. Nonteratogenic Effects: Hypoadrenalism may occur in infants born of mothers receiving corticosteroids during pregnancy. Such infants should be carefully observed. Nursing Mothers: It is not known whether triamcinolone acetonide is excreted in human milk. Because other corticosteroids are excreted in human milk, caution should be exercised when Azmacort Inhalation Aerosol is administered to nursing women. Pediatric Use: Safety and effectiveness have not been established in pediatric patients below the age of 6. Oral corticosteroids have been shown to cause growth suppression in children and teenagers, particularly with higher doses over extended periods. If a child or teenager on any corticosteroid appears to have growth suppression, the possibility that they are particularly sensitive to this effect of steroids should be considered. Geriatric Use: Clinical studies of Azmacort Inhalation Aerosol did not include sufficient numbers of subjects aged 65 and over to determine whether they respond differently from younger subjects. Other reported clinical experience has not identified differences in responses between the elderly and younger patients. In general, dose selection for an elderly patient should be cautious, usually starting at the low end of the dosing range, reflecting the greater frequency of decreased hepatic, renal, or cardiac function, and of concomitant disease or other drug therapy. The table below describes the incidence of common adverse experiences based upon three placebo-controlled, multicenter US clinical trials of 507 patients (297 female and 210 male adults (age range 18-64)). These trials included asthma patients who had previously received inhaled beta 2 -agonists alone, as well as those who previously required inhaled corticosteroid therapy for the control of their asthma. The patients were treated with Azmacort Inhalation Aerosol (including doses ranging from 200 to 800 mcg twice daily for 6 weeks) or placebo. In older controlled clinical trials of steroid dependent asthmatics, urticaria was reported rarely. Anaphylaxis was not reported in these controlled trials. Typical steroid withdrawal effects including muscle aches, joint aches, and fatigue were noted in clinical trials when patients were transferred from oral steroid therapy to Azmacort Inhalation Aerosol. Easy bruisability was also noted in these trials. Post Marketing: In addition to adverse events reported from clinical trials, the following events have been reported post marketing: anaphylaxis, cataracts, and glaucoma. There are no data available on the effects of acute or chronic overdose. However, acute overdosing with Azmacort Inhalation Aerosol is unlikely in view of the total amount of active ingredient present and the route of administration. The maximum total daily dose (1600 mcg) has been well tolerated when administered as a single dose of 16 consecutive inhalations to adult asthmatics in a controlled clinical trial. Chronic overdosage may result in signs/symptoms of hypercorticoidism. (See PRECAUTIONS .) The risk of candidiasis could also be increased. Adults: The usual recommended dosage is two inhalations (200 mcg) given three to four times a day or four inhalations (400 mcg) given twice daily. The maximal daily intake should not exceed 16 inhalations (1600 mcg) in adults. Higher initial doses (12 to 16 inhalations per day) may be considered in patients with more severe asthma. Children 6 to 12 Years of Age: The usual recommended dosage is one or two inhalations (100 to 200 mcg) given three to four times a day or two to four inhalations (200 to 400 mcg) given twice daily. The maximal daily intake should not exceed 12 inhalations (1200 mcg) in children 6 to 12 years of age. Insufficient clinical data exist with respect to the safety and efficacy of the administration of Azmacort Inhalation Aerosol to children below the age of 6. The long-term effects of inhaled steroids, including Azmacort Inhalation Aerosol, on growth are still not fully known. Note : In all patients, it is desirable to titrate to the lowest effective dose once asthma stability has been achieved. Patients Not Receiving Systemic Corticosteroids: Patients who require maintenance therapy of their asthma may benefit from treatment with Azmacort Inhalation Aerosol at the doses recommended above. In patients who respond to Azmacort Inhalation Aerosol, improvement in pulmonary function is usually apparent within one to two weeks after the initiation of therapy. Patients Maintained on Systemic Corticosteroids: Clinical studies have shown that Azmacort Inhalation Aerosol may be effective in the management of asthmatics dependent or maintained on systemic corticosteroids and may permit replacement or significant reduction in the dosage of systemic corticosteroids. Directions for Use: An illustrated leaflet of patient instructions for proper use accompanies each package of Azmacort Inhalation Aerosol. Azmacort Inhalation Aerosol contains 60 mg triamcinolone acetonide in a 20 gram package which delivers at least 240 actuations. It is supplied with a white plastic actuator, a white plastic spacer-mouthpiece and patient's leaflet of instructions: box of one. NDC 60598-061-60. Each actuation delivers 200 mcg triamcinolone acetonide from the valve and 100 mcg from the spacer-mouthpiece under defined in vitro test conditions. For best results, the canister should be at room temperature before use. CONTENTS UNDER PRESSURE. Do not puncture. Do not use or store near heat or open flame. Exposure to temperatures above 120°F may cause bursting. Never throw canister into fire or incinerator. Keep out of reach of children unless otherwise prescribed. Store at Controlled Room Temperature 20 to 25°C (68 to 77°F) [see USP]. WARNING: Contains CFC-12, a substance which harms public health and the environment by destroying ozone in the upper atmosphere. A notice similar to the above WARNING has been placed in the "Information For The Patient" portion of this package insert under the Environmental Protection Agency's (EPA's) regulations. The patient's warning states that the patient should consult his or her physician if there are questions about alternatives. Manufactured for: Kos Pharmaceuticals, Inc.